Yule or the Winter Solstice takes place on 21st December. Because the cycle of the Earth around the Sun isn't exactly the same length as our calendar year, the dates can fall on the 20th or the 22nd of December, however it is generally the 21st that is considered the festival of Yule. Yule is the celebration of the longest night and shortest day. After this point our days will begin to get longer and the light return to the world. 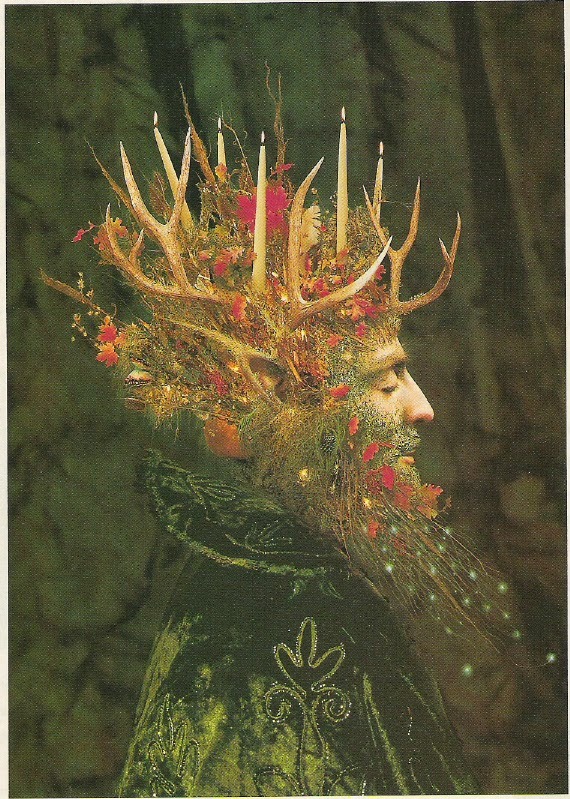 Yule is one of the fire festivals on the Wheel of the Year, a time of great warmth and celebration. This special time marks a turning point for our Earth: the days have reached their longest point and from now on until the Summer Solstice the light will return. The celebration of the Winter Solstice therefore focuses heavily on the themes of hope and renewal. As new life is slowly breathed into the world, so we can look at new starts within our own lives. 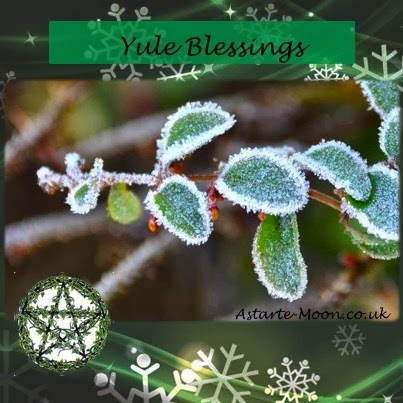 Yule is also all about family, love and security. We give thanks for the family and friends that we have in our lives and spending time with them during the Yule holidays helps strengthen that bond. The world Yule appears to have many possibilities for its origin that I have found. The word is said to have been derived from the word Jul, Jol or Juul in the Pagan Norse tradition which is a word meaning ‘Wheel’ The Feast of Juul was a festival observed in Scandinavia at the time of the December solstice. In countries like Scandinavia and Norway, people were forbidden to use wheels on the day of the Solstice as they waited for the return of the light. This is because they believed that the Wheel of the Year stopped turning for a brief moment as one cycle ended and another began. The Old Norse 'jol' is said to have been borrowed in Old French as 'olif', which gave way to the Modern French 'joli'; "pretty, nice," originally meaning "festive"
Yule is also know as Alban Arthan (Gaelic for ‘the light of Arthur) and also may have derived from the Anglo-Saxon Hweol also meaning Wheel. According to Webster's Dictionary, Yule originates from "geola" (Old English for "ice"), another name for the month during which it was celebrated. "Modronacht" (Mother's Night) is another name for the Winter Solstice. Yule is often celebrated as a 12 day celebration, it begins on "Mothers Night" (December 21st) and ends 12 days later on "Yule Night" (January 1st). This period of time is the origin for the Christian "12 Days of Christmas". ( can you recite all the verses for the song ‘On the twelth day of Chrismas my true love sent to me…..!). When ancient people used a lunar calendar, it left about 12 days left over each year. So the twelve nights of Yule were considered to be not part of the old year, or part of the New Year. Thus as these twelve days were separate for the other days of the year they were considered to be especially important and sacred. Dec. 20 to Dec. 23. During the 1st 3 days - The virgin Maiden Goddess is honored as a guide for moving forward into the new year, to set you on a fulfilling and positive path. Dec. 23 to Dec. 26. The 2nd set of 3 days - The Mother Goddess is honoured for fertility and all your projects ahead of you. Dec. 26 to Dec 29. The 3rd set of 3 days - These 3 days are for the rebirth of the God, and honoring his guidance. Dec. 29 to Jan. 1. - The last 3 days of Yule are a celebration of the Old Crone Goddess who is honoured for her wisdom and as the teacher in the lessons of life and spirit. She is also honored as the waning year giving way to the new year. At the culmination of these 12 days the new year was then celebrated. In Norse traditions Red Thor rides pas in his sled pulled by magical goats and brings presents for the children. 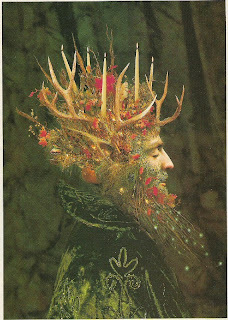 Yule is represented by the death of the Holly King and the birth of the Oak King, the God of the Waxing Year. Robert Graves suggests in his book The White Goddess that the two figures, the Holly King and the Oak King represent the two haves of the year. They constantly strive for superiority with the Holly King being victorious over the Oak King at midwinter and the Oak King winning in midsummer. The colours of Yule, red, white and green are said to have come from the Holly Tree, Mistletoe, and honoring the Goddess and the God. The Goddess at Yule is Queen of the Darkness. She will give birth to the Child of Promise, the Sun God, who will bring light back to the world. The Sun God is often named Lugh in Celtic traditions. He is reborn in human form to rejoin his beloved wife Eriu. 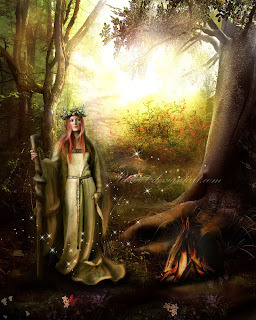 Eriu is described as a hag, who transfoms into a beautiful Goddess by the marriage and personifies the land of Ireland. Many ancient monuments around the world have been found to be related to the Winter Solstice. Stonehenge is most famously believed to be in alignment with both the Winter and Summer sunrise and many people gather there each year to see the sunrise over the heel stone. The Newgrange burial mound in Ireland is another ancient monument said to be aligned with the winter Solstice, the dawn light hitting the inner shrine. This Stone Age monument dates to around 3200 B.C., making it 500 years older than the Great Pyramid of Giza in Egypt and a thousand years older than England's Stonehenge. Yule has long been celebrated as an important festival the world over. Of course in the Christian world it has been taken over by Christmas but as we will explore, many of the traditions we associate with Christma such as mistletoe and the Christmas tree stem from pagan practices in place a long time before Christianity. Ancient Pagans’ lives revolved around harvest and livestock. Thus many traditions concentrated on giving thanks and ensuring that good luck would continue. The winter solstice was a time of honoring the sun and giving thanks for the bounty that sustains the family throughout the cold winter months. Misltletoe. In the Pagan Norse tradition the Norse god Balder was son of Frigga, goddess of love and beauty. She loved her son to such a degree that she had the four elements (Fire, Water, Air, and Earth) promise that they would not harm her son. However the evil God Loki found that mistletoe could harm Balder and shot him with an arrow made from the plant. The white berries are said to be Frigga’s tears at the loss of her beloved Balder. 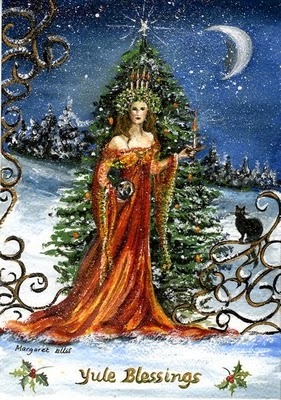 Luckily Balder is restored to life, and Frigga is so grateful that she reverses the reputation of the mistletoe, making it a symbol of love and promising to bestow a kiss upon anyone who passes under it. Thus when we pass under it, the kiss we receive is a sacred kiss from the Mother Goddess herself! A kiss under the mistletoe was often considered to be a promise of marriage and commitment. Mistletoe was considered highly sacred by the Druids because, as a parasitic kind of vegetation, it never touched the earth (growing instead on oaks and other trees) and also like holly bore berries in the middle of winter. 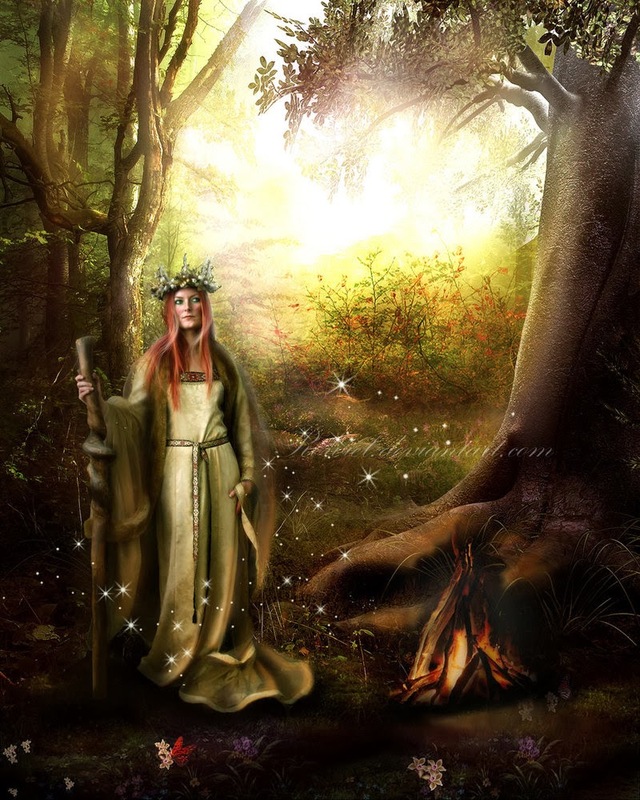 Druids gathered the leaves and berries from oaks trees with special sickles made of gold. They called mistletoe "all-heal" because they believed it had the power of protection against illness and bad events, and also because they believed mistletoe spread goodwill amongst people. Legend says that enemies meeting under the mistletoe cast their weapons aside, greeted each other amicably, and honored a temporary truce. Misteltoe was also considered as a symbol of fertility. Yule Log. This was traditionally a large log that was selected on size because it had to burn throughout the twelve days of Yule. 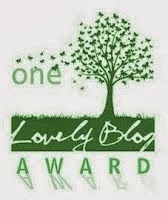 In ancient times A tree was chosen on the eve of Yule, often an oak as they were considered sacred. The huge log was then pulled from the forest into the town or village. As many people as possible grabbed onto the ropes to help pull, because doing so was believed to bring good luck in the New Year. The log was lit with a scrap of burned log carefully preserved from the previous year, a practice that ensured the continuity of good fortune from year to year and from generation to generation. Various Pagan religions around the world used the ashes in various ways to ensure luck and protection throughout the coming year. The ashes were sprinkled under beds, at the threshold, around crops and trees. For the Vikings, the Yule log was an integral part of their celebration of the solstice, the julfest. On the log they would carve runes representing unwanted traits (such as ill fortune or poor honor) that they wanted the gods to take from them. It was thought that as the log burnt so these unwanted things were erased. You may want to have your own Yule log in your home this winter. Select a log that has fallen from a tree if possible. One common part of the Yule tradition was that no unnecessary work would take place in or around the household as long as the log burned. This encouraged people to get together and relax with family. This custom still continues today as we spend time with family and friends. The ‘Christmas’ Tree. Again many parts of the world had different traditions concerning the Yule tree. Christmas trees are thought to have evolved from the rite of symbolically selecting and harvesting a "sacred tree," a practice found in many ancient cultures. Evergreens and firs were sacred to early peoples, including the ancient Greeks, Celts, and Germans. Evergreens remained green while other vegetation lost their leaves and appeared lifeless during the bitter winter cold, thus they were seen to be sacred trees. The German word for Christmas tree is not Kristenbaum, or Christmas tree, but Tannenbaum, or sacred tree. In Roman times, on the night before Saturnali Roman priests called "tree-bearers" cut one of the sacred pines, decorated it, and carried it into the temple. Many ancient cultures chose a special tree to be part of their celebrations, perhaps decorating the tress around their homes or bringing a tree into a special meeting point in the centre of their towns and villages. Decorating the Yule tree was seen as a way of ensuring the return of the summer abundance. Trees were often decorated with fruit, nuts, flowers and berries. Try this Yule to bring in some greenery from outside into your home and decorate your tree with the fruits of the earth such as dried fruit and nuts. The ancient Egyptians considered the palm tree to symbolize resurrection. They decorated their homes with its branches during the winter solstice. The ancient Pagan Romans decorated their Saturnalia trees with bits of metal and replicas of their god, Bacchus [a fertility god]. They also placed 12 candles on the tree in honor of their sun god". Wreathes. The wreath circle symbolizes the wheel of the year and the completion of another cycle. Often wreathes are made with holly and ivy, the holly representative of the Goddess and ivy the God. Like evergreens holly was seen as magickal as it bore berries in the middle of the cold winter. Both holly and ivy were seen as sacred and as a protection against any negative forces. 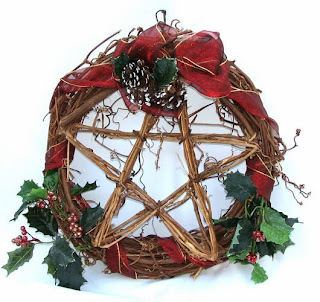 Perhaps you would like to make your own decorative wreath this year? Carol singing. Carol singing from door to door is said to come from the tradition of ‘Wassailing’. Wassailing or to "wassail," is a word derived from the Old Norse 'ves heil'. In Old English 'hál' meant "be in good health" or "be fortunate." By about the 1600s, the practice of taking a wassail bowl containing a type of wine or cider about the streets had taken root. Instead of consuming the drink at home, wassailers went house to house offering a warm drink and going Wassailing was born. The wassailing tradition also sometimes included drinking the cider or suitable wine as a toast to a tree or orchard in the hope that it would continue to flourish. Yule or Winter solstice celebrations were held by many cultures around the globe. Yule celbrations were practiced among such diverse groups as Native South Americans, Celts, Persians, Orientals, and Africans. The Winter Solstice was known as Sacaea to the Mesopotamians, the Festival of Kronos to the ancient Greeks, and as Saturnalia to the Romans. In the Norse tradition, the Valkyrie looked for souls to bring to Valhalla during Yule. Norwegians stopped hunting and fishing for the twelve days of Yule in order to allow the weary world to rest and to hasten the arrival of the sun. In ancient Rome the festival of Saturnali begins on December 17 and lasts for seven days. It was held to honour Saturn, the father of the gods and was characterized by the suspension of discipline and reversal of the usual order, disagreements were often forgotten about at this time of the year and people forgivien for any misdemeanors. Wealthy Romans at the time of Saturnali would exchange lavish gifts. There would be feasting, and they would hand over the Freedman's hat (also known as a Liberty Cap or pileus) to their slaves and serve them dinner, although the slaves still had to cook! In Russia it was customary to sprinkle grain on your doorway as a way of bringing luck and ensuring plentiful food over the coming months. In many Baltic lands today corn is still scattered in the doorway, also the ashes of the Yule log are scattered near fruit trees to increase their yield in the summer/autumn. In both France and Germany ashes from the Yule log were mixed with cows’ feed to help them to produce healthy carves in the springtime. French peasants also believed that if the ashes from the Yule Log were kept under the bed, they would protect the house against thunder and lightning. In the northwestern corner of Pakistan, a festival called Chaomos, takes place among the Kalasha or Kalash Kafir people. It lasts for at least seven days, including the day of the December solstice. Chaomos involves ritual baths as part of a purification process, as well as singing and chanting, a torchlight procession, dancing, bonfires and festive eating. In Cusco, Peru there is a major celebration for the Winter Solstice which begins in the town and proceeds to the local ampitheatre. 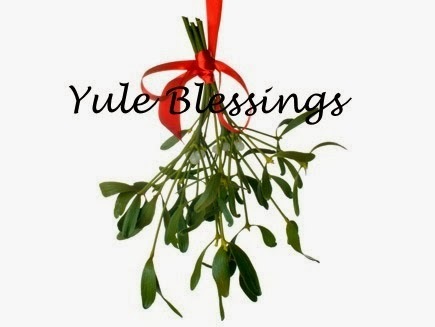 It is apparent therefore as we look at cultures around the world that Yule has always been an important festival. The themes of re-birth, returning of the light, love and family are ones that are echoed across many parts of our world. It is a time for protecting ourselves and the lives of those we hold dear, a time to ensure harmony amongst all people. 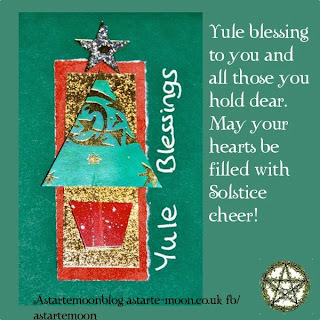 How do you celebrate Yule? Do you have any particular traditions that happen every year with your friends and family?